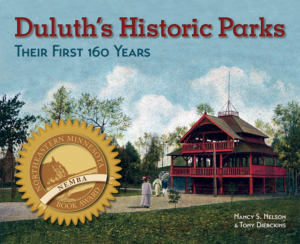 Built in 1891, Duluth’s first recorded athletic complex was a simple baseball diamond below Superior Street at Twenty-Eighth Avenue West called “Recreation Park.” By the time the Duluth Cardinals professional baseball club entered the Northern League in 1903, Recreation Park was a memory and the team needed a place to play, so in April contractors hastily built a wooden ballpark with seating for three thousand in the shadow of Duluth’s ore docks at Thirty-fourth Avenue West and Superior Street. Known as Athletic Park, it was a very simple affair: the seats were unadorned boards, and there were no locker rooms for players. The next year the team became the Duluth White Sox (winning pennants in 1904 and 1905). A portion of Athletic Park was converted to a hockey rink as a home for the Northern Hockey Club, but it was late December before the weather turned cold enough for outdoor ice. While built for Duluth’s professional baseball team, Athletic Park doubled as a municipal facility. When not used by the White Sox, Athletic Park hosted baseball and football matches played by children from local elementary and high school teams as well as adult teams made up of employees from various Duluth businesses (Clyde Iron Works fielded a particularly strong baseball squad). The facility also hosted wrestling matches, and in 1909 two teams representing local Ojibwe and Dakota bands squared off in a lacrosse match. During World War I, shipbuilding firms and other outfits producing materials for the war effort formed a football league that played at the park. That league was where Harry Grant, father of NFL legend Harry “Bud” Grant, learned to play the game he taught to his son. In 1926 the Kelleys became the Duluth Eskimos, a team that included Hall of Famers Ernie Nevers, Johnny “Blood” McNally, and Walt Kiesling as well as hometown hero Wally Gilbert and players primarily from Duluth, the Iron Range, Two Harbors, and Superior. They only played one game at Athletic Park: because of Nevers’s star power, the NFL made the Eskimos play every game except their first on the road in order to sell more tickets. Professional baseball in Duluth went dormant in 1917 when the United States entered World War I. It returned in 1934 with the revival of the Northern League. The next year Frank Wade fielded the franchise’s Duluth team at Athletic Park. The Duluth Dukes—an affiliate of the St. Louis Cardinals—took home the league’s 1937 pennant. The next year Duluth began planning for a new municipal stadium, and after “All Sports Stadium” was built in 1940, the old ballpark was demolished.